Ben Boyd’s Wanderer, painted by Oswald Brierly. From Wanderer Replica Project website. Today the story of a bunch of people with history and salt water in their veins, people making progress on ambitious plans to build a replica of an 1830’s luxury sailing ship. 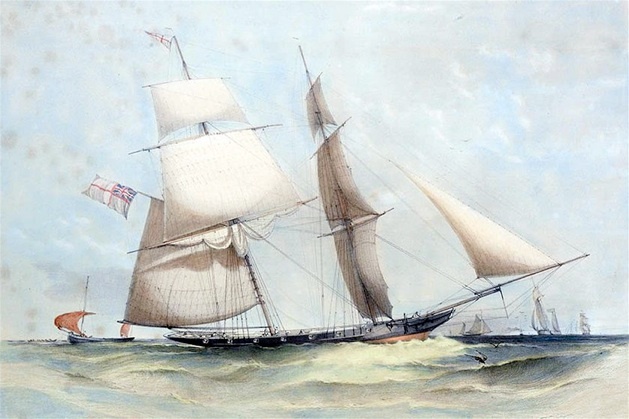 Scottish-born entrepreneur, Ben Boyd sailed the 25 metre Wanderer into Sydney in July 1842, he soon set sail for Twofold Bay at Eden on the NSW Far South Coast following four steamers crammed with supplies down the coast. Seeking his fortune, Boyd quickly established a network of pastoral properties spanning a landscape that took in the sea and the snow. He also took charge of coastal steamship operations linking the region with Sydney, Melbourne, and Tasmania, and was a player in Eden’s whaling industry. Part of his enterprise remains – the impressive Seahorse Inn. Construction started in 1843 using sandstone imported from Sydney and oak fixtures from England. Boyd’s Tower on the southern shores of Twofold Bay is his other legacy. Constructed in 1847 the 23-metre-high lighthouse was intended to guide his fleet of ships home. A number of challenges, not at least his overly ambitious plans and the financial depression of the time, combined to undo Boyd and he was declared bankrupt in 1848. He left Eden on the Wanderer to restore his fortunes in the Californian Goldfields, but his treasure chest was never the same. He was last seen in the Solomon Islands hunting for duck. Creditors came looking, but his body has never been found. The Wanderer Replica Project was launched in 2014 by a group of locals with a love of Boyd’s story and skills in shipbuilding. Fundraising moves ahead, and so too does the ship building. I caught up with one of the committee members selling raffle tickets. Jon Gaul says apart from the historical and tourist interest the completed Wanderer will also offer youth training and development programs. My partners in this program can also help you explore much of this history, Light to Light Camps explore the coastline between Boyd’s Tower and Greencape Lighthouse in style – it’s kinda like Attenborough meets Kardashian. Check in with Jenny, Arthur and Jake at Light to Light Camps. Thanks for tuning in – your feedback and stories ideas are always welcome, flick me an email to [email protected] or we can connect via the About Regional Facebook page. Carrie Underwood is my favourite country singer. She is young, beautiful and charming female in her 30s. Her strong voice takes me away from all issues of this planet and I can enjoy my life and listen songs created by her mind. Now the singer is on a Cry Pretty 360 Tour started in May of 2019. The concerts scheduled for this year, up to the last day of October. Tickets are available for all men and women with different income. If you are a country music lover as me, then you must visit at least one Carrie's concert. All tour dates are available at the [url=https://carrieunderwoodtour.com]Carrie Underwood tour Salt Lake City[/url]. Open the website and make yourself familiar with all powerful Carrie Underwood concerts in 2019!